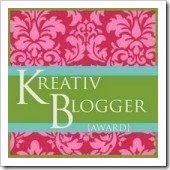 So Dez was gracious enough to pass along the Kreativ Blogger award! I think this means that I need to name 7 things that nobody knows about me and then pass the award along to five other people, who will have to do the same. Some of you may already know some of these things but I'll try to surprise you! I HATE to write Cedar Park on our address. We practically live on the line for Cedar Park and Austin and it was almost enough to keep me from buying this house. Nothing against Cedar Park but I desperately miss writing the word Austin on our mail. I want to start a garden to grow our own fruits and vegetables but I scared of trying because I have NO IDEA where to start. It would make me unbelievably happy to never have to buy produce from the grocery store again. I wish I spoke Spanish fluently. I think it's a beautiful language and I love when Spaniards, Mexicans and/or anyone from a Spanish speaking country speaks English. I think it adds an interesting sound to the English language that I really enjoy hearing. I want to live abroad (for at least a year). I think I would enjoy any of the following: Italy, Spain, England or Ireland. I'm not picky but I would really enjoy getting to see the way other countries function and I don't think I could get that from a vacation to those places. I hate shopping. It takes way too long to find anything that I like and I have better things I could be doing. It also makes me really angry to spend the money. I can think of so many other uses for it. I don't make lists. I wish I did. I wish I made: to-do lists, grocery lists, goal list, any list. I've tried. Somehow I still manage to get the things done that I need to complete. The following are some of the things that make my throat, tongue, lips and ears itch: bananas, pecans, watermelon, kiwi, almonds and sometimes apples. Most of this I still eat. I don't get rashes from them and my throat doesn't swell so I figure it's okay. I would like bestow the same award to the following:) : Mom, Dad, Erin, Kayla and Sarah. Have fun!